Kika, a small logging town, Cameroon 2010, is located in the Congo Basin, one of the last great forest reserves in the world. These forest ecosystems and freshwater systems are home to abundant wildlife and provide food, shelter, clean water and protection against floods. The economic value of these systems is enormous. Timber alone is worth several billion of Euros, annually, while minerals are also being heavily exploited. China is the country's largest market for exported logs and gave almost $10,000 in per capita aid to the central African country. In June of last year, 50 countries signed on to the Chinese-led Asian Infrastructure Investment Bank, including the U.K., Germany, Australia, and South Korea, acknowledgement of China’s success in driving development through mega-projects to build railways, bridges, freeways, and airports. China’s history of secrecy surrounding its development projects drives speculation about its motives. Even in countries that support the AIIB, there is anxiety about the bank’s underlying foreign policy agenda, especially in light of trends in Africa, the largest regional recipient of Chinese aid. Despite the political and media interest around Chinese development finance flows to Africa, and the motives behind it, data about Chinese government aid to Africa is scarce. The government publishes only a fraction of the data about its development projects, according to researchers behind a new project to document Chinese aid to Africa. China.aiddata.org is a project of AidData, a group formed in 2009 by the College of William & Mary, Development Gateway, and Brigham Young University. The ChinaAid database has been updated recently with 2013 data and partially fills the void of information on Chinese foreign development projects by aggregating information about Chinese aid projects from journalists, scholars, government officials, business professionals, and local community stakeholders. AidData systematizes the collection of open-source information about project-level aid from donors who have been either unable or unwilling to disclose this data themselves. Critics of the database, including Deborah Brautigam, Director of the International Development Program and China-Africa Research Initiative at Johns Hopkins University, point out that the data relies heavily on media reports which can tell users only that projects were announced and not whether they were actually carried out. Since its first release of data in 2013, AidData has diversified its sourcing: about half its data now come from media reports while the rest come from Chinese and other government documents, international organizations, and academic papers. On average, AidData has calculated that each project cited is backed up by three different sources. AidData’s researchers have also deployed software that uses filtering and keyword search functions to identify and eliminate duplicate projects, as well as perform several other automated data quality checks. Still, errors remain. AidData’s own analysis shows that projects in urban areas are over-represented in the media and the site has introduced algorithms to correct for its overuse of English-language media which, particularly in non-English-speaking countries, may further skew results. In addition, for 43 percent of projects, AidData does not include the value of the project, and therefore these projects are excluded from the database. This data, which identifies nearly U.S.$100 billion in aid from China to Africa from 2000-2013—about as much given by the United States over the same time period, according to the OECD—is not as complete as official government statistics would be if they were to be made public, though even if that were to happen the fuzzy line between the Chinese government’s definitions of aid and investment would make even official data complicated to interpret. These substantial caveats notwithstanding, the database remains the most comprehensive information available on project-level Chinese aid to Africa and gives academics, journalists, and policymakers new insights into a previously opaque topic. Infrastructure projects dominated Chinese investment for more than a decade, with energy, transportation, and communications projects accounting for half of spending from 2000. South Africa received more than $5 billion for transportation and storage projects alone. Kenya, Sudan, Mozambique, and Angola, all countries rich in resources but facing logistical challenges, received more than 2.5 billion as well. Sudan, Ethiopia, Nigeria, Zambia, and Angola each received more than $2 billion for energy projects alone. Nigeria and Ethiopia received more than a billion dollars each in funding for communications projects—including a nearly $8 million loan to Ethiopia for an ICT infrastructure project, a half a billion dollar loan to Nigeria to build a space satellite, and several projects in Nigeria and Ethiopia to improve mobile coverage in rural areas. At the bottom of the list are sectors including population, reproductive health, and environmental protection. Health and education, top priorities for Western donors, also fell low on China’s list. Angola has received more than $12 billion in aid from China since 2000, making it the top recipient of Chinese aid in Africa. Sudan, Ghana, and Ethiopia are close behind, each having received about $10 billion over the same period. In “China’s Aid to Africa: Monster or Messiah?,” Yun Sun, writing for the Brookings Institution, explains that starting with Angola in the early 2000s, “China [has] frequently provide[d] low-interest loans to nations who rely on commodities, such as oil or mineral resources, as collateral.” According to this strategy, “the recipient nations usually suffer from low credit ratings and have great difficulty obtaining funding from the international financial market; China makes financing relatively available—with certain conditions.” Angola is also China’s largest African trading partner and, beginning in 2004, China has won favorable conditions for mining deals there, along with a multitude of associated construction contracts. Most of the top recipient countries are rich in natural resources—including oil, diamonds, and gold—and much of China’s aid focuses on making that wealth accessible for export. Often, China stands to gain as well. According to Deborah Brautigam, between 2004 and 2011, China received favorable concession terms for extractive industries not only in Angola, but in seven other resource-rich countries where China has extended loans, including in top-ten aid recipient countries Ghana and the Democratic Republic of the Congo (DRC). While the purpose of $30 billion in aid to Africa can’t be pinpointed, transportation and energy, essential to extracting valuable natural resources, are the largest identifiable sectors. For instance, these are the top two sectors for Chinese aid to Sudan, an oil-rich country that is regarded as a pariah state by most of the world. Almost none of the Chinese aid received by the DRC or Ghana can be categorized by sector while most of the funding to Nigeria, whose oil and corruption boom have gone hand and hand, goes to energy, industry, and mining according to the AidData database. 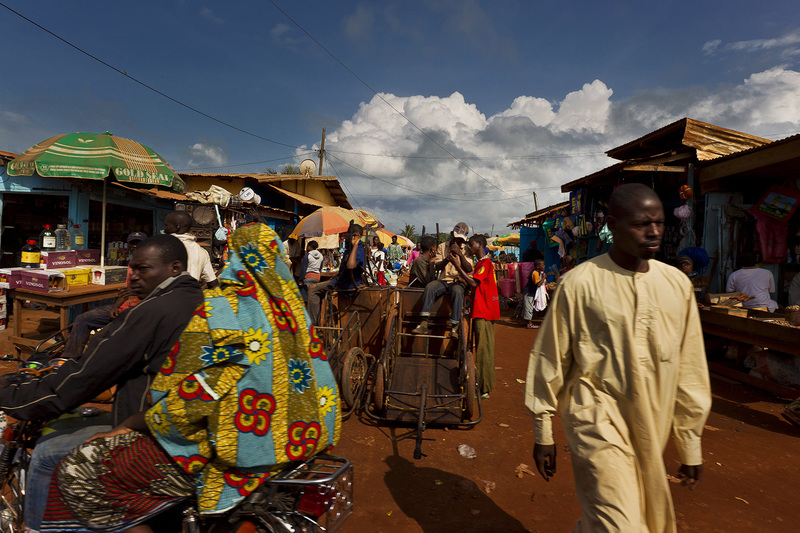 According to analysis by The Economist, while oil accounts for about 70 percent of the Nigerian government’s revenue, the industry is woefully mismanaged, fueling corruption, environmental degradation, and conflict, compounding doubts about the “resource curse” that has plagued other countries rich in environmental resources but poor in governance, which can exacerbate inequality. A recent BBC report estimated that crime associated with oil is the biggest national industry after oil itself. Energy and communications are the largest sectors funded in Ethiopia, one of the only resource-poor countries that received significant funding from China. Cameroon, a country facing a deforestation crisis due to the influx of palm oil plantations, banks the most Chinese aid per capita at just under $10,000 over the course of the study. China is one of Cameroon’s largest trading partners and is its largest market for log exports. According to the World Resources Institute, “despite efforts to promote sustainable forest management, 3,300,000 ha of Cameroon’s forests have been cleared since 1990—an area approximately the size of Belgium.” Most of the funding received by China goes to water supply, transportation, and energy generation. The small country of Equatorial Guinea, the third-largest producer of petroleum in Sub-Saharan Africa, received the second highest amount of Chinese aid in proportion to its population, with nearly $2,000 per capita between 2000 and 2013, almost entirely for energy projects. The Seychelles, the third highest per capita recipient and recently a site for oil exploration, received almost as much as Equatorial Guinea, though the purpose of the aid is not known. Mauritius, a non-extractive industry country known for its transparency, economic growth, and accessible Indian Ocean location, all of which make it an attractive trade partner for China, received a similar per capita amount, mostly for transportation projects. The DRC and Angola round out the top five for per capita funding, both of which also top the list of top gross recipients and are resource rich. Aid commitments to Africa from the United States and China, the two largest aid donors, are roughly equal, based on OECD and AidData data. They are followed by European Union Institutions, France, Germany, and the United Kingdom. China and the United States each donated approximately $100 billion over 13 years ($94.31 billion and $104.812 billion, respectively). At this level, aid is such an economic force in itself that it can be used as a tool of soft power to influence the policies of recipient countries. Aid from China defies Western categorization, and in this article projects categorized by AidData as “Official Development Assistance,” which are funds that meet the OECD’s criteria for development assistance, “Other Official Flows,” which mix development aid and trade activities that benefit the donor, and “Vague,” which do not have enough detail to be categorized as one or the other (but are not strictly business investments), are all included in the data. AidData’s rubric is broader than that used by most western donors through the OECD’s standards. Unlike the OECD’s rubric, AidData’s includes grants that explicitly benefit the economy of the donor country, such as favorable or exclusive trade agreements or mining rights, which often appear in aid packages issued by the Chinese government. 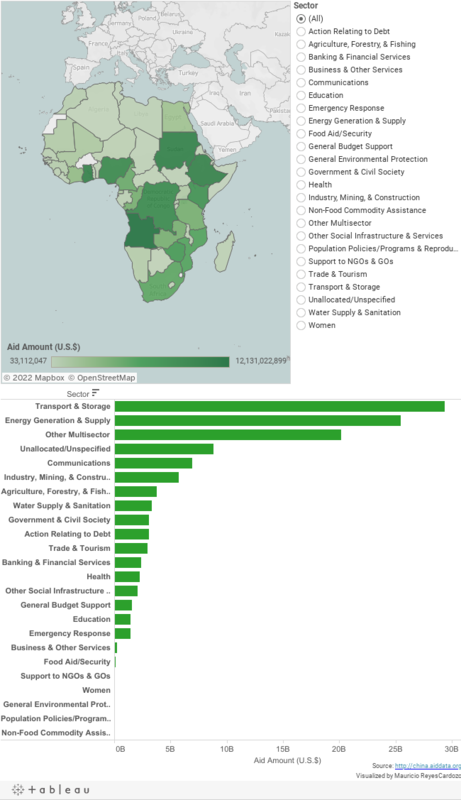 Over the 12 years AidData has tracked, many projects were either difficult to classify or involved multiple sectors, though infrastructure remained the dominant theme. Energy and transportation received consistently high levels of funding throughout the 12 years, with communications also among the top five sectors with lower but consistent levels of funding. Transportation funding spiked in 2013 to $13 billion, four times as high as in 2011, the next highest year, and drove an overall peak in funding by China. China’s political and economic motivations in granting aid to Africa drive public interest in this topic. Much of the early coverage of the China AidData project highlighted a concentration of Chinese aid resources in the hometowns of African heads of state. “Aid on Demand: African Leaders and the Geography of China’s Foreign Assistance,” a study published along with the database, shows that “more Chinese aid is allocated to the political leaders’ birth regions and regions populated by the ethnic group to which the leader belongs.” In a continent where patronage is a major political force, such resources can bolster a ruling party’s power. This may exaggerate China’s agenda. According to Yun Sun, “China’s investment in and trade with Africa represents 3 percent and 5 percent of its global investment and trade, respectively,” so political patronage may not be the overriding concern, or rather, it may be evidence of a piecemeal resource race by different Chinese government bodies rather than an overall foreign policy strategy to win political influence on the continent. In other words, there may not be an overriding national agenda in the allocation of aid by China. Chinese overseas development aid is primarily motivated by humanitarian and socioeconomic needs and does not favor authoritarian or corrupt regimes or countries with an abundance of natural resources, according to an AidData working paper. Instead, it is the more commercially-oriented forms of assistance that come with higher interest rates, and money is more often lent rather than granted, and targeted at resource-rich and more corrupt governments. Since it is difficult to categorize the spectrum of Chinese aid, commercially-driven investments are often conflated with more traditional aid projects and an economically-motivated narrative is superimposed on a more complex reality. A Source of Stability or Instability? Since the motives remain murky, many researchers have turned instead to trying to understand the impact of Chinese aid on the politics, economics, and security of recipient countries. In the report “Rogue Aid? The Determinants of China’s Aid Allocation,” the authors find that China’s aid allocation decisions are shaped by politics and economics, but not more so than other donors, and that China’s aid allocation does not favor autocratic or corrupt regimes. There is also little conclusive research into how much Chinese aid contributes to economic growth or income inequality of recipient countries. Despite China’s current economic woes, the new Asian Infrastructure Investment Bank opened its doors in Beijing in January. It is expected to issue one of its first loans to India within the year, according to Reuters. The $100 billion in capital held by the bank exceeds the entire amount documented in the 13-year AidData database. The financial sway held by the new institution could reshape multilateral aid efforts in Asia just as a decade of Chinese aid to Africa has transformed the geopolitical landscape in Africa in ways that research to quantify such aid are just beginning to reveal. Correction: This article has been updated to reflect the correct spelling of Deborah Brautigam’s name.